In stock 58 items in stock. It took me around an hour to assemble as it was included lots of small parts but it was easy though despite that it runs great. I recently bought one from here http://goo.gl/bDPUkY and I think I made the right choice. It has two motor and gearbox sets to have wheels running in different directions and great for hobbies or educational project. Assembly took me about one hour due to the small parts involved. This works well with the Pololu Round Robot Chassis. Each of the included motors draws ~0.35A at 5V when unloaded. Short circuit current is ~0.75A at 5V. The useful voltage range is ~2.0-8.4V. Is it safe to use these motors with an Arduino mega? More specifically does the Arduino have the current capacity required for both motors? Unfortunately the bare pins on an Arduino can't supply enough current to directly run these motors (the pins can output 40 mA, but the motors require hundreds of mA). However, you can run the outputs through a motor driver board, such as the Ardumoto (http://www.sparkfun.com/commerce/product_info.php?products_id=9213), which will supply the necessary current and give you other nice features such as forward/reverse, etc. 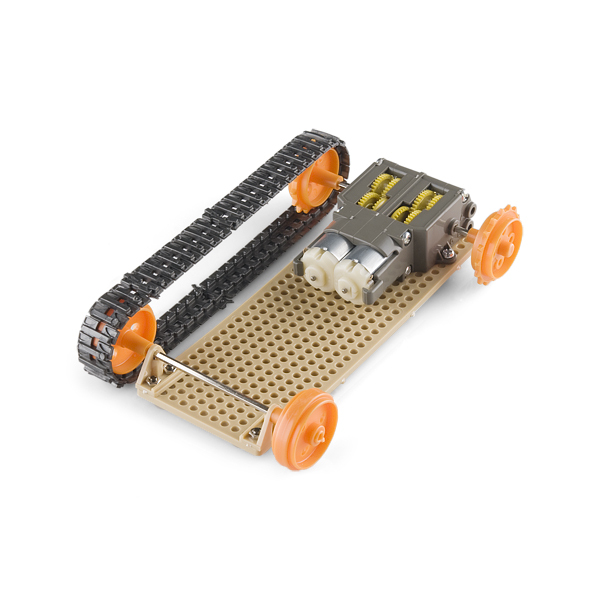 Check out the Robotics / Drivers section of our website for more information. I had a hard time powering the Dual Motor GearBox motors at high pwm's with the Ardumoto driver board; possibly because the motors that come with this gearbox operate best at a low voltage (1.5-3.0 V). I recently purchased some 6 volt replacement motors from Pololu (http://www.pololu.com/product/1117) that fit perfectly into the gearbox and move well at both high and low pwm's. I have purchased and assembled this but both wheels move at the same time. The description says it can drive 2 wheels independently. Is there any trick to get this to work in differential drive? I want each wheel/shaft to move separately. nevermind, i had both allen screws tightened on the hex shaft. You are only supposed to do 1 side for differential drive. With stock motors the Related products (COM-00315) "H-Bridge Motor Driver 1A" is not a good choice to drive these. The included motors draw 2.2A each when stalled and are only "supposed" to be operated from 1.5 to 3v. Driving them higher significantly reduces their life. Take a look at the FA-130RA datasheet from Mabuchi. Mabuchi does make motors that operate on higher voltages and have lower stall currents which can be substituted with the motors that come with this gearbox. Is it absolutely essential to grease the gearbox when using the Tamiyo tank treads? This sounds obvious, but I think some extra recommendation could be useful. What is the recommended driver shield for an Arduino Uno given that the Ardumoto is out of stock and the SN754410 is only 1A? The 1A is not sufficient as the motors are spec for 2A on stall. There is a Pololu Low Voltage Dual Serial Motor Driver, which is recommended with this gearbox however I am having difficulty locating an appropriate H-Bridge digital line driver. The serial requires extra byte code which is fine, however, it does not have an H-Bridge for reverse direction and I am sure other users would also like to investigate any other recommendations. I have tried Motor Driver 1A Dual TB6612FNG with success on this motor and gearbox. Quote "The TB6612FNG motor driver can control up to two DC motors at a constant current of 1.2A (3.2A peak)." I love this little motor but it is noisy! The instructions can be downloaded from that link. They specify that you should use M3 screws to mount the gearbox (3mmx8mm tapping screws into wood/plastic w/ a 2.5mm pilot hole, or 3mmx10mm screws with a 3mm nut through "thin plate"), but they don't specify the distance between mounting holes. The motor is specified as an "FA-130" which presumably means http://www.mabuchi-motor.co.jp/cgi-bin/catalog/e_catalog.cgi?CAT_ID=fa_130ra There are two different models, with nominal voltage 1.5V and 3V, respectively. Don't know which one comes with the kit. What is the rpm.,. ?? Is it just me, or are the gears in this extremely loud? 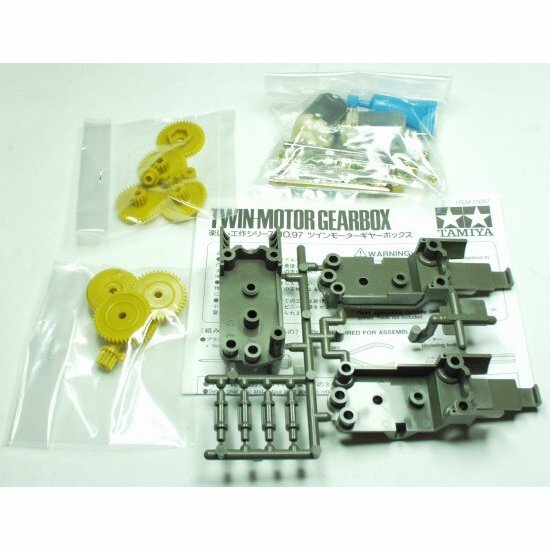 I purchased this motor gear box, but after putting it together, the two motors don't turn independently - they are connected via the middle shaft. They are supposed to run independently, right? What did I do wrong, please? Anybody had this problem? Problem solved. One incorrectly positioned nut :). What motors come in the kit? Is the "ArduMoto" motor driver shield you sell here a good fit to work with these motors? Also, is it possible to get a spec sheet so I can design a custom enclosure for this and the other parts of the thing I am building? 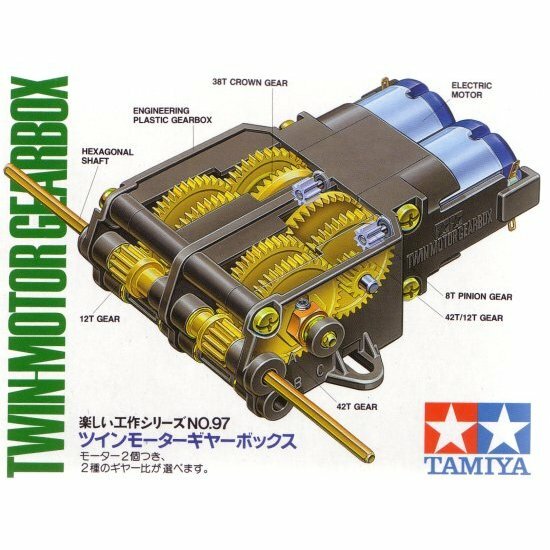 Will this fit / work on http://www.tamiyausa.com/product/item.php?product-id=70108 ??? Seeing that you can setup different gears on each wheel maybe you would think that you can start your robot in one gear and then change gear by starting the other motor but that doesn't work because if only one wheel spins then the other one would be dragged; you need to spin both motors at once. i have a question and I would be greatful if anyone could help me, I do not know how to kenect the 2 toy motors in the dual motor gearbox to the arduino inventors kit and have them run independently? Someone please HELP!!!!! I have a problem. A big problem. A HUGE problem! Y'know that little pinion gear with the hex shaft that you put the wheels on? Nevermind! I emailed them and they should be mailing me a replacement part! Thanks SparkFun! Would anyone be capable of providing the profile dimensions of this, I need to be sure that it will fit in the limited space I have. The directions are absolutely terrible. After being put together, though, it does seem like a nice little gearbox. I'm surprised that no one mentioned how the instructions are written in Japanese. Huh. The one I got has translations. GOOD translations. Instructions should be changed, I have seen many people complaining about the motors not being independent when using the ''fast mode'' when in fact they are, the instructions aren't very clear with that. I love mine by the way, pretty strong, motors draw a bit too much current though, piggy back two sn754410, and it shouldn't cause any harm. They state clearly "Do not secure." for one of the gear hubs. Tamiya sells great stuff. Just gone done build a track kit + chassis kit + twin gearbox tank to control with the Arduino. hey..i was working on a grid follower robot which has to pick up blocks and all..for an event (A.N.T.Z ,IIT-Bombay(techfest))..should i go for this arrangement or I should use stepper motors(or DC or servos)..which will be best? n can i increase the distance b/w the tyres..plz reply.. Assembly is pretty straight forward, instructions could be a little clearer, as the diagrams are only isometric. I was able to get it to turn fully assembled with a "AA" battery (1.5vDC). Not really enough lube for all of the bushings on it, as well as gearing. It did come with mounting spots, as well as with mounting hardware -- a nice feature. Overall, I give it a thumbs up. Dorsai65, the gearbox is small, about 10cm from the tip of one axle to the other. Each axle extends about 3cm from the gearbox. I can't find precise specs anywhere, I don't believe it was included with the product. I had no problem driving the motors with a SN754410 quad half H-Bridge. I used it on a small bot which weighed slightly under 1kg. In the high-torque configuration the bot zipped around at about normal walking pace, and had no trouble on slight inclines, thick carpet, etc. What are the mechanical specs? How wide/long/high? How far do shafts extend from enclosure, and what diameter are they? This was a great little gear box. I used it on a Sumo Robot, which weight ~1kg. My requirement was to push other sumo robots out of the arena. Therefore I assembled it in the "HIGH TORQUE" mode. The instructions in the assembly process were very straight forward, and I believe anyone can do it. Took me about 30 mins. I used the SN754410 to control my sumo robot. I also used the "Tamiya racing wheels" (white ones). One of the most important things things when using this gear box is that, you need to build a cover for it. Otherwise, the gear box is very fast, that it can pick up unwanted stuff from the ground. A good example is hair. My sumo robot turned out to be a good success and i highly recommend this product for similar applications. this motor: http://www.mabuchi-motor.co.jp/cgi-bin/catalog/e_catalog.cgi?CAT_ID=fc_130rasa seems to fit the bill perfectly. Runs at 12v, with a 0.84A stall current and seems to be exactly the right size. If only I could actually buy one from somewhere! Surprisingly decent little gearbox and motors. I have to be honest, when I ordered this I expected it to be junk since it's a lot of plastic. However, after watching the excellent SparkFun video showing proper assembly.. I got it built in no time without screwing up any gearing. I built a lightweight little tank 'bot around it and it works very well. I can't recall which gear ratio I utilized.. I think the same one shown in the video.. but it moves around at a very snappy pace. The included motors should be easy to replace if the need arises because they're a very common size. I wouldn't expect this to power a 'bot of any significant weight, but for your average room prowling cat-chaser, it's a good buy. Terrific little gear box for the price! I used this gear box for my Arduino tank project and it works flawlessly. It's also nice that you can have a few different positions for the drive axles. I first assembled it with the ratio of 58:1 and the tank moved too fast, and didn't have the torque to get over a DVD cover. I disassembled it and made it 203:1. Now this tank has some torque and will really climb! Assembly is easy and reconfiguration is pretty quick. I recommend this to everyone and I'm actually thinking of getting a couple more! Thanks, Sparkfun!